Part of living lightly on the planet is reducing the square footage of your home and living space. 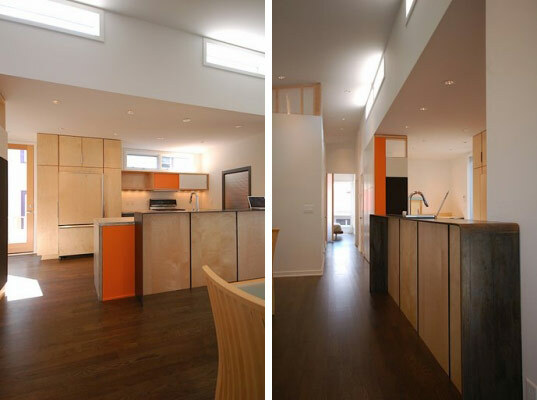 We applaud home designers like Minneapolis-based Hive Modular for presenting a very practical and stylish 2-bedroom home that is only 1,410 square feet. This new home was completed on an urban infill lot and is part of Hive’s popular B-Line series. Optimally situated, this home is a great example of a solar passive home and features many green design elements that help make its environmental impact minimal. This model of B-Line Small shown here is a simple bar-shaped design with a flat-pitched roof that takes advantage of the southern aspect. Flat or more traditional roof designs are also available. This particular house has 2 bedrooms, kitchen, dining and living space. However, all homes are constructed with modular elements and the B-Line series can be expanded to include more rooms, larger spaces and extra bonus rooms. Construction costs for B-Line homes start from $160/sq ft, not including the cost of the land. According to Paul Starkney, co-founder and partner for Hive Modular, this home cost $185/sq ft to build. The stylish little home features many environmentally-friendly products including concrete counter tops, no-VOC interior paint, FSC-certified framing wood and locally-sourced flooring, James Hardie fiber cement exterior cladding, a rainwater collection system, energy-efficient appliances and use of recycled materials. The cute house exemplifies living practically — from its building process to its infill location; from the small yet adequate size, to the sustainably-sourced materials. I live in central Texas and am interested in small modular , prefab, or manufactured housing that has a small carbon footprint. I am looking for a three bedroom container home. How can I find out how much and when I can have one built for me. very interesiting. Is this available in the northeast, in Massachusetts? Good point Markus B. Drought tolerant planting would have completed the picture/design. Nice! But why the lawn? Part of living lightly on the planet is reducing the square footage of your home and living space. 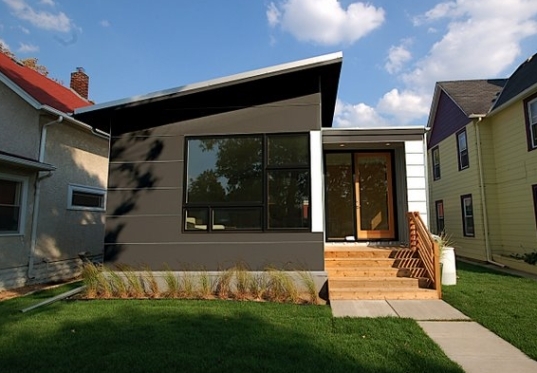 We applaud home designers like Minneapolis-based Hive Modular for presenting a very practical and stylish 2-bedroom home that is only 1,410 square feet. This new home was completed on an urban infill lot and is part of Hive's popular B-Line series. Optimally situated, this home is a great example of a solar passive home and features many green design elements that help make its environmental impact minimal.